I have a problem with being “Hangry.” Do you know the term “Hangry?” It’s when I miss a meal or it’s getting late for a meal and my blood sugar gets a little low. Suddenly I turn into the Hulk and explode in unnecessary, silly anger at little things. I’m like the people in those creative Snicker’s advertisements that say, “You’re not yourself when you’re hungry.” That is getting hangry. Sounds like, in our first reading, the Israelites were a little hangry. God just freed them from slavery and they start complaining about not having food. In the gospel, Jesus rightly tells the crowds following him that they are eager to search for him, not because of his miracles or teaching, but because he fed them and they are hungry again. Being fed is such a basic need. Those in the world with little or nearly no food suffer greatly because of it. Those of us who rarely miss a meal still feel the pangs of hunger from time to time. Obviously, we need to eat to live. When the crowds ask how they are to accomplish the works of God, Jesus answers, “This is the work of God, that you believe in the one he sent.” If we are going to do God’s work and get eternally fed, then we have to believe and trust in Jesus Christ. Jesus is the only thing that will satisfy the hunger in our soul. Anything less than that leaves us hungry again. How do we satisfy this hunger? As Catholics it is the Eucharist. The Eucharist is bread from heaven. The Eucharist is Jesus himself. The Eucharist is the ultimate feast and the food that satisfies our soul. Extra Credit: I highly recommend Peter Kreeft’s book “Prayer for Beginners” which you can order from here or your favorite online retailer. 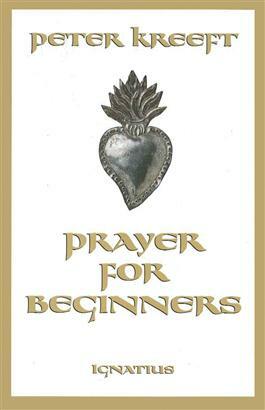 First HNOJ parishioner to ask or email me about it gets a free copy. 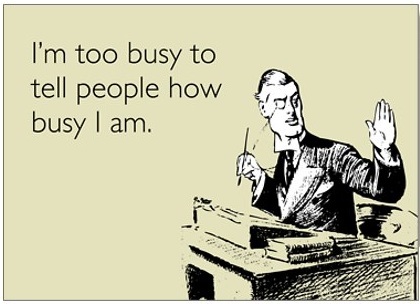 Have you ever told someone you were too busy for them? I wish I didn’t, but the people in my life I probably say this to the most are my kids. I never actually say those words, but what I often do is suggest they go play outside or in the playroom or go ask mom. Rarely is what I am doing so important that I shouldn’t take the time for them. Gosh, I don’t even like admitting this truth. The thing is God is never too busy for us. He is never too busy to hear our trivial story or complaining or good news. God is never too busy to pay attention to exactly what we are saying. God is never too busy to give us exactly what we need. Certainly he doesn’t always give us what we ask for or want, but he is never too busy for us. However, we often treat God like he is too busy, right? We say things like, “God doesn’t care about whether I am sitting in traffic, God has bigger issues in the world.” And yes it is true that there are bigger issues than Minnesota construction traffic, but that doesn’t mean he is too busy to listen to us. God attends to us absolutely. In our Gospel Jesus and the Disciples are exhausted. They are so busy ministering to people they, “had no opportunity even to eat.” Yet, on their way to rest and food, the crowds follow. Jesus “moved with pity” decides to forgo his rest so minister again to the people. The same is true in our life. Jesus never tires of ministering to us. If we turn to God, God is there. If we speak, God listens. If we listen, God is powerfully present (sometimes we have trouble hearing – another blog topic altogether). We can trust that no matter what, God won’t abandon us. God is never to busy for you. Hearing God’s voice in the midst of our noice is tough, but he is always there. Take 5 minutes everyday this week to sit in silence. No words. No pressure. Just 5 minutes of silence. At Bellerive Elementary School, I played a lot of kickball. Our field was lava-hot blacktop with yellow painted bases and base paths. If we kicked it far enough the ball would race past the hop scotch kids run all the way down a hill to the dumpsters behind the school – automatic homerun. We used to divide into two teams by naming captains and then have them pick their teams. Classic. In our readings this Sunday, we hear about people being chosen by God. In the first reading, Amos explains that he was a shepherd, minding his own business, when God called him and sent him to prophesy to Israel. In the gospel, Jesus chooses the Twelve to go out and proclaim the good news, to call people to repent, and to heal the sick. In the 2nd reading, Paul reminds the Christians of Ephesus that they have been chosen to praise God. The thing with all these readings is that they show us that God has chosen us too. And God continues to choose you. What has God chosen you to do? First, God has chosen you to be loved by Him. God chose you to be loved before you were ever born. The 2nd reading says, “He chose us in Him (Jesus), before the foundation of the world.” God chose us to be loved through Jesus Christ before creation of the world even took place. From the beginning of time to the end of time God loves and chooses you. Second, God has chosen us to respond to his love. When someone tells us that they love us, we respond in some way, right? Same with God. God, through the scriptures, Mass, Reconciliation, our daily life, our spouse/family, and more is telling us that He loves us. How we respond matters. God showers His love down upon us, and our response is what we call “worship.” The 2nd reading says, “In him we were also chosen…so that we might exist for the praise of his glory.” If you’ve ever seen an overwhelmingly beautiful sunset and quietly said, “Oh wow God, thank you,” you’ve worshiped. Really praying the words or songs as Mass is another example of worship. Saying the simple prayer, “God you are awesome. Today was tough, but you got me through.” That is worship. Third, God has chosen us to tell other people about our experience of God. Amos was sent to Israel. The Twelve were sent to the towns around them. You and I have been sent to our friends, our family, and Plymouth/Maple Grove/Wayzata/Medina, MN. When we have a profound experience of God’s love, we respond to God with praise, and we tell others about it. We were made for this. We have been chosen by God for this. Read the readings for this Sunday, July 12 by clicking here. Hear more about being chosen by God. 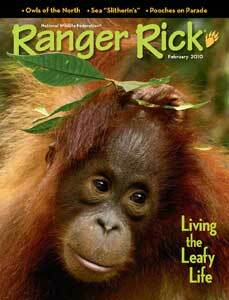 All the cool high school kids had Ranger Rick posters up in their rooms right? The first time I brought my wife home for Christmas to my parent’s house was eye opening for her. Of course she was amused by my childhood home and the innumerable Ranger Rick nature posters on the walls of my bedroom (I was a weird kid). But more so she kept saying this revealing phrase, “Something happens when you go home. You turn 16 again.” She pointed to leaving plates in the dinning room and not helping with dishes, treating my sister like a kid sister, and selfish tantrums as evidence of this return to home = return to immaturity. I reminded her the journey to immaturity wasn’t the long for me. So I think it is interesting to read in the gospel today about Jesus returning home. Jesus doesn’t pull the regression, but instead it is the town who won’t let Jesus grow up. It is the town, which balks at Jesus growth and new mission. It is Jesus own community that won’t let Jesus, well, be Jesus Christ. Consequently, Jesus can’t perform great healings and miracles. The faith of the people is the key component to Jesus’ work because God never forces himself on us, but instead relies on our cooperation and surrender. Sometimes I am like the people of Jesus’ hometown. I am comfortable with Jesus the nice guy or even Jesus the food multiplier, but Jesus the life changer, Jesus the revolutionary, Jesus the God of the universe who invites me to give up my wealth and comfort and power to follow him – that Jesus is harder to listen to. If you want Jesus Christ to perform mighty deeds in your heart, don’t limit Jesus to what you remember from childhood religion class, but let Jesus be the bold, powerful, Savior he came to be.